It wasn't long before we needed to get back to the car, as the temperatures outside were in the 90s and you could feel your skin starting to sizzle when out in the sun. A joint decision to head south west towards where initiation was decided and we parked up in Fargo to watch a cell appear in front of us and grow rapidly. This was our cell and the chase begun. The cell showed on the satellite as just east of Canadian, but did not appear on the radar for a good 45 minutes to an hour after was saw it. 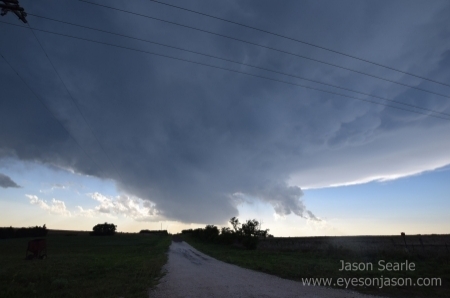 This cell had a strong updraft and the conditions meant it had started to rotate. 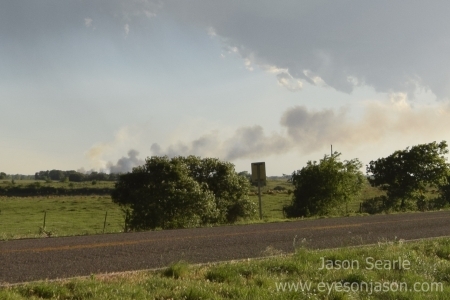 We continued south west towards Gage, before dropping south on the 46 towards Arnett. At Arnett, a small lay-by gave us the chance to take some photographs and admire the spectacular mammatus clouds forming above our heads. It was also producing some frequent cloud-to-ground lightning, so we had to exercise caution when we left the vehicle. We travelled further south again towards the town of Roll, before heading west towards Durham. 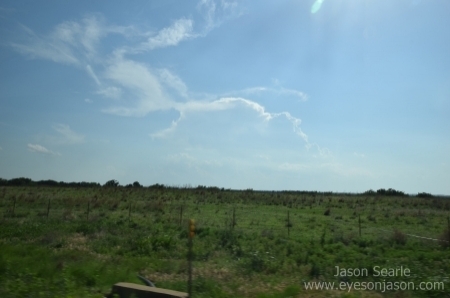 We sat near Durham for a fair while, watching the storm develop a nice meso. Radar showed the whole thing rotating from tilt one to tilt 4 and a strong couplet noted. See Nature's Fury passed us and parked up for a chat, although everyone was a little edgy due to the frequent CGs that rained down around us. For those worried about me at home, I sat safely in the car - lightning is one thing I really don't like chancing. Sadly the cell had started to die off. The SPC had given the area a 2% tornado risk, should the storm move eastwards, but it stayed put until its death. Whilst dying off, a new cell formed rapidly in front of us and seemed to be feeding off of the dying storm. 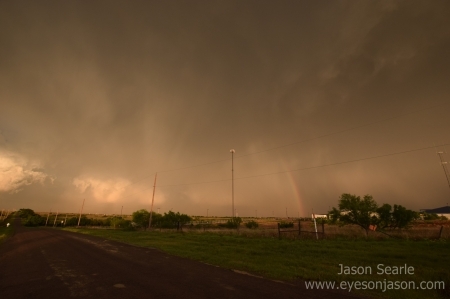 A wall cloud had descended on the new storm, rapidly becoming a low precipitation supercell. The lightning in the area did not mix well with the dry landscape and some of the nearby lightning strikes causing localised fires. Smoke plumes appeared in several areas of the landscape and the small fire engine that raced by to sort it out looked like it was going to have some difficulty controlling it! It was beginning to get late, so we had to decide where we were staying for the night. We didn't want to sack this one off just yet, but similarly we didn't want to be restricted when it comes to hotel choice and food options. 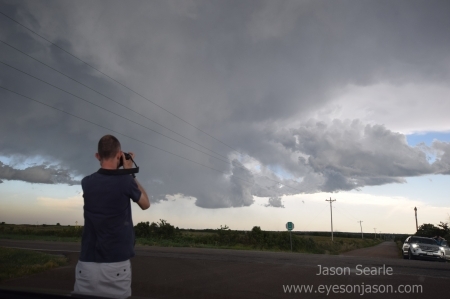 I suggested we chase the storm south towards Erick, before heading back north west through Sayre. Enroute to Erick, the storm started to be lit up by the setting sun, giving perfect lighting conditions for some brilliant photo opportunities. Sunset, storm and rainbows - absolutely stunning. We ended up booking the Super 8 in Elk City (one week after we stayed in Elk City last). Before wishing the storm farewell, we sat off the I40 near Sayre to enjoy the sunset-lit mammatus and structure, before dining in the Boomtown Grill in Elk City. I do have some incredible shots from today, but want to be able to bring out the best in them before posting them - so stay tuned to the blog/facebook/instagram when I return in early June. Tomorrow looks to be a travelling day, heading north for a slight risk in NE Colorado to the Nebraska panhandle on Sunday. We thought the season may have been over due to the liklihood of a subtropical storm Alberto interfering with the weather here. We shall see...but a lee trough is providing some great chasing conditions through until Tuesday.